Lauren loved it; I thought it was pretty good. I guess it's just hard accepting Owen Wilson, 48, as "over the hill." The mentor now, subbing for Paul Newman. We're not that old, are we? I dunno, maybe we are. We attended a concert Thursday, a 'tribute' band that performed Fleetwood Mac's greatest hits, and everyone in the audience had gray hair and walkers. I thought to myself, "Man, FM sure attracts an old crowd," then realized I was among that very demographic. So I guess that makes me Paul Newman. Long in the tooth, over the hill, and mentor now, not protégé. Don't think I like that very much. 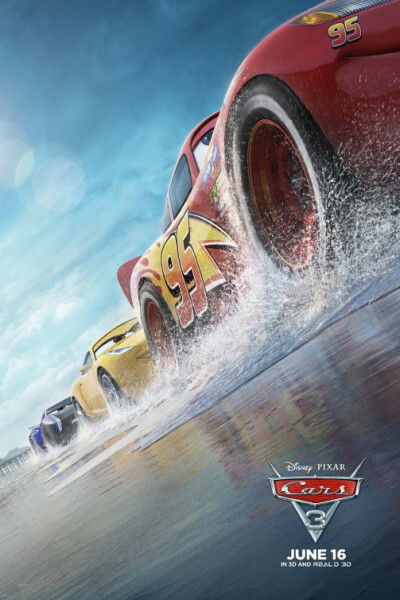 Anyway, Cars 3 is fine enough, though I'm also weary of the 'Rocky training montages,' which is what comprises the bulk of Cars 3. You know, Owen [Lightning McQueen] needing to shed a few pounds and pick up his pace. "Good night, John Boy," fade to black.